Transfer: We may be able to put you in contact with an independent taxi driver who may be able to collect you from the airport and bring you to the retreat the price is around Euros 45. Please email sarah@ibizayoga.com with your date, ETA and flight number. Taxis hired from outside the airport arrivals lounge charge around €45 and €50 & €55 at night. Email me to see if I can organise this, it's not 100% but I will try. Directions: There are two routes that will lead you to the retreat. Here we have given directions for the shortest, easiest route that takes you along a brand new road with plenty of street lighting, making for a smoother journey. Halfway to Sta Eularia (about 10-15 minutes into the journey), look out for a Left-Hand Turn, signposted Santa Gertrudis and San Miguel. Take this turning. If you miss the turning don't worry you can continue along this road for several miles before seeing the sign to Benirras. On the approach to San Miquel, you will see the white church of San Miquel, sitting high on the approaching hilltop. When you reach the town of San Miquel you are looking for a right-hand turn with a brown signpost for Benirras. Take this turn. Follow this road for about 5minutes (approx. 2km), you will then see a brown signpost for a left-hand turn to Benirras, this turn is at a crossroads. Take this turn. This winding road will bring you all the way to Benirras. In the daytime, you can see the Pagodas and Villa Roca on the hillside, from the road, on the left. Approx. 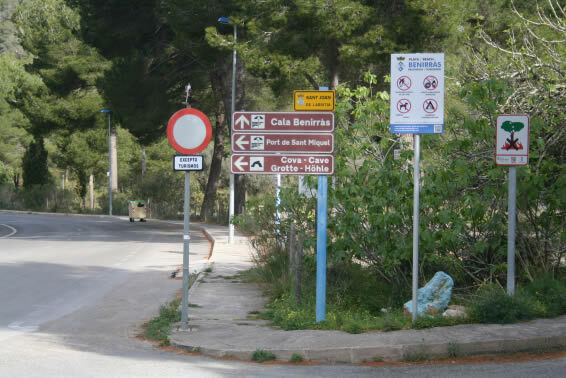 100m from the beach, you will find a staggered crossroads, signposted, to the left for “caves” and Port San Miguel. You are on our doorstep now. Villa Roca: Girar a la izquierda, senalizado vereis “cueva” y Port san Miguel, pasareis por un pequeno Puente. Despues de pasar por este Puente vereis una entrada a la devecha, subiendo hacia la villa, vereis una roca pintada de color azul claro. 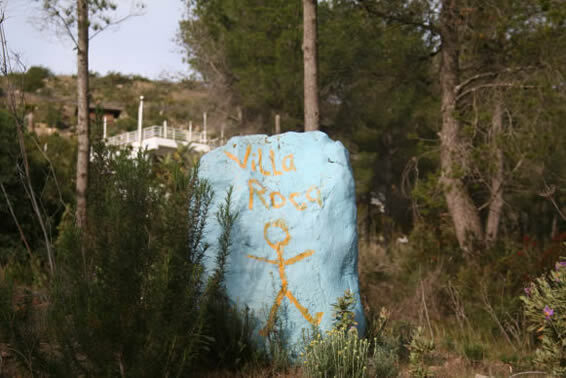 Hay otro villa justo debajo de Villa Roca. Subid directamente al villa y vereis un aparcapiento para coches justo delante de una pequena pared echa de roca. Option 1 Bus. Direct Bus from Ibiza Town to Benirras. From June to September ONLY. There is a bus direct to Benirras it leaves from Ibiza Town it is the number 23 and 23a. Check out their website named Ibiza Buses for all the details. The fare can be as low as €3. The bus stop in Benirras is a 2-minute walk from our place. Walk along the road with the sea is behind you. We are the first houses / 3 villas on the right hand side. You may see the Teepees in the Garden. Option 2 Buses , From Airport to Town. From Town to San Miguel , then Benirras is 6.3 Kilometres from the bus stop. October to May. Option 3 Bus /Coach: There is a shuttle bus service from the Airport to Puerto San Miguel please see www.holidaytransfers.com The service costs around £32 return. The Puerto (port) is an 8-minute taxi ride from the retreats - the taxi ride may cost around Euros 10 each way. To walk takes 45 minutes along a coastal path. The distance is 3.9 Kilometres. Option 2 Information. Ibiza Bus Timetables and Island maps can be found at the Tourist Information Desk, that is situated immediately in front of you when you come out of the arrival gate at the airport. There is another bus that goes into Ibiza town which you will need to take to connect with the bus to Benirras. The bus stop where you can get the "L10" bus to Ibiza Town, is situated just outside of the front doors of the airport, to the right of the Tourist Information desk. Cost into town €3. The L10 bus will drop you at the Bus station on the Avenguda Isidor Macabich (Ibiza Town). There are several bus stops running along this stretch of road. From here you can catch a bus to either San Miguel or Port San Miguel (our nearest villages). The bus that runs to San Miguel is the L25 and the one that runs to Port San Miguel is L25a. The bust to San Miguel is much more frequent than the one to the Port. These buses will cost approx 4 euros. On the bus journey, look out for Santa Gertrudis, a small town situated in the middle of the island. San Miguel is around 7minutes from here. You can identify when you are arriving in San Miguel when you can see a beautiful white church on a hilltop, approaching ahead. The only transport from San Miguel to Benirras is by taxi, there is no bus service. The cost is approx €8 in a cab. To walk from San Miguel to Benirras on one route the distance is 6.3 kilometres , this is the scenic route along the coast. It will take approx 1 hour 20 minutes. Please be aware that the walk follows narrow, windy, steep country roads with little to no footpath. To walk from Port San will take approx 45 minutes or a taxi will cost around 10 euros. Please be aware that this walk also follows narrow, windy, steep countryside roads along a cliff with no pedestrian footpath. 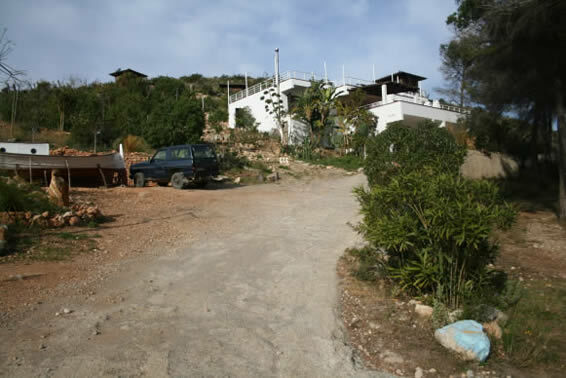 Photos of what you will see when you are a 60 seconds walk up the hills to the villa/s. The island is very small, well signposted and only about 30km long but if you do find yourself a bit lost, please call us and we will be more than happy to give verbal directions. If your arrival time differs from the time you have stated when booking, please text the manager so we can be here to greet you upon your arrival. Have a good journey and see you soon! Loose fitting clothing for yoga practice, ideally shorts rather than long pants, sunblock, citronella or mosquito repellent, comfortable walking shoes for exploring the beautiful surrounding countryside, a torch, a camera, a European conversion plug, an EHIC health card (formally E111), ear plugs, any medication you may need, waterproof clothing, though rain is rare in June, July, and August. If staying in the Pagodas you may want to bring some warm clothing, especially in low season. The nearest cash machine is in San Miquel, which is about an hours walk away, so make sure you bring enough euros for your stay if you don’t have a car. For Villa Roca and Pagoda Garden guests wanting to travel with only hand luggage, or wishing to leave space in their suitcase for gifts or interesting island crafts, we offer towel hire as towels are not provided. Prices for towel hire are:- Beach Towel £5, Bath Towel £5 or a bundle of 3 towels including Beach, Bath and Hand Towels £10. Bookable in your account with us or on arrival. There is 24 hours, free WIFI internet access in Villa Roca it stretches to Pagoda 2 and 3 only and Meditation Hut. Please click to view our timetable. Self serve breakfast, juices and fruit are available throughout the day. The cooked, vegetarian meal will be served between, directly after the yoga class and up to half an hour after the finish of the yoga class on Sunday, Monday, Tuesday, Wednesday, Thursday and Friday. There is a shuttle bus service from the Airport to Puerto San Miguel please see www.holidaytransfers.com The service costs around £32 return. The Puerto (port) is an 8-minute taxi ride from the retreats - the taxi ride may cost around Euros 10 each way. To walk takes 45 minutes. If your time of arrival differs from the time you give us at the time of your booking please text email or call us to let us know - thanks.